With the midterm elections less than two weeks away, we look at the governor’s race in Georgia, where Democrat Stacey Abrams is attempting to become the first black woman governor in the country. A new investigation has found Georgia secretary of state and Republican gubernatorial candidate Brian Kemp has overseen the removal of more than 340,000 current Georgia residents from voting rolls. Greg Palast, a journalist who has been investigating Brian Kemp and voter suppression in Georgia is interviewed. He has joined a lawsuit against Kemp over the purge. 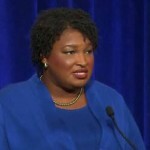 During Tuesday’s debate, Georgia Democratic gubernatorial candidate Stacey Abrams defended her actions in 1992 when she helped burn the Georgia state flag, which at the time contained a prominent Confederate battle flag. In a victory for civil rights advocates, the flag was later changed. Leah Wright Rigueur is a professor at the Kennedy School of Government at Harvard University. In Kansas, local officials are under fire for moving a majority-Latino city’s single polling site outside of city limits, more than a mile from the nearest bus stop. Dodge City, Kansas, is 60 percent Hispanic, but the Associated Press reports that Hispanic turnout was just 17 percent in Ford County, where Dodge City is located, compared to 61 percent turnout for white voters in 2014. The ACLU reports that the city’s lone polling site services more than 13,000 voters, compared to an average of 1,200 voters per polling site at other locations. Johnny Dunlap, chair of the Ford County Democratic Party is interviewed.